Tomorrow is Valentine's Day and many people will be busy thinking about love. Many will be preoccupied with their loved ones and our church will be using this to lead others to God's true and perfect love. 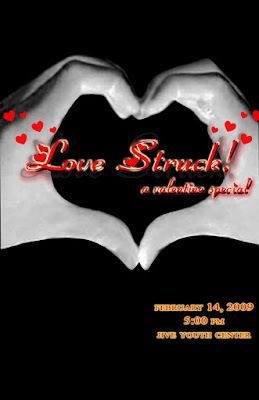 Our church's youth ministry organized a Valentine banquet entitled "Love Struck". There will be a live band presentation, videos and inspirational message all after dinner. The ticket price is P50 and seats are limited to 50 persons only. We hope that many of the invited friends and guests of our young people would come and that they would get to hear a clear presentation of the gospel. Please pray for this Valentine outreach event.